Woodford01263 715779work01603 870304fax Self-cateringWoodford provides a fantastic escape for the whole family to enjoy including your four-legged friends with stunning dog-friendly beaches on the doorstep. The village itself has several family friendly pubs and restaurants, for that special occasion there is a Michelin star restaurant too! Nearby Hunstanton is a five minute drive with two supermarkets, great for all your shopping needs making the house an ideal choice for a relaxing family holiday and a perfect place to explore the area. The house is close to the popular Coast Hopper bus route with superb locations nearby to explore. • General: O.F.C.H. Electric fire. • Security Deposit: £250 refundable deposit is payable to Norfolk Country Cottages or a non-refundable damage waiver deposit. Kitchen with electric two oven Aga, large fridge freezer, dishwasher, microwave and docking station. Woodford offers weekly bookings starting on Friday. Woodford provides a fantastic escape for the whole family to enjoy including your four-legged friends with stunning dog-friendly beaches on the doorstep. The village itself has several family friendly pubs and restaurants, for that special occasion there is a Michelin star restaurant too! 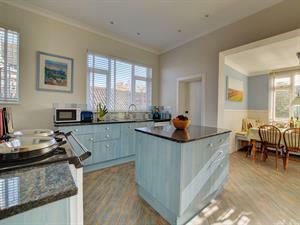 Nearby Hunstanton is a five minute drive with two supermarkets, great for all your shopping needs making the house an ideal choice for a relaxing family holiday and a perfect place to explore the area. The house is close to the popular Coast Hopper bus route with superb locations nearby to explore.